Coos, croaks, and quacks, no not a strange firm of solicitors, just the sweet sounds of nature that welcomed me into the parks of La Laguna. It was a pleasant 21 degrees as I stepped off the tram after a 40 minute glide from Santa Cruz, Hesperides Cafe got its usual vist for my coffee and chocolate herradura, then I headed through Plaza del Cristo and onto the Parque La Constitution. The ducks looked very subdued in their purpose built pond and duck house but managed a lazy few quacks for me. I could understand there laziness, the small park was beautiful and restful. 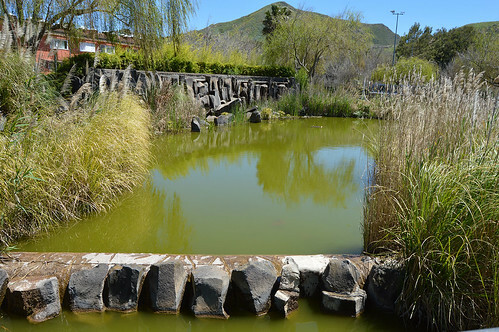 Venturing back a few yards I entered the much bigger Parque La Vega and it was quietly bursting with sweet blooms, bird song, and the gentle croaks of frogs in the slow moving, meandering green stream. Both parks have a small cafe building, neither has been open since 2016 as the council can’t find any serious bidders to run them. What a shame, La Vega in particular, just begged for visitors to take a break with a cold drink and a cake. La Vega had informative boards showing the different type of wrinkly old croakers that lurked by the waters edge, and a bird guide showed the main feathered visitors. 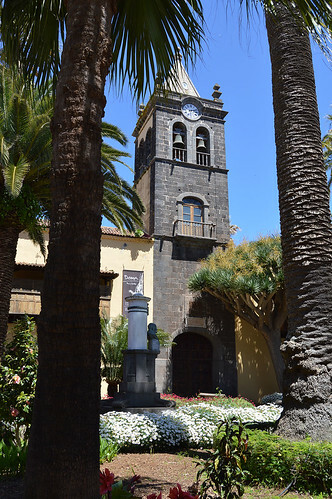 The historic pedestrianised streets of La Laguna were much busier with tourists but still kept an attractive serenity. The trip back down to Santa Cruz reminded me of what a smooth and practical addition the tram had become in it’s first 10 years of operation. Getting off at Plaza Weyler it was just a short stroll to Parque Garcia Sanabria, another favourite of mine. The constant screech of green parakeets reminded me of their details on the board back in La Vega. 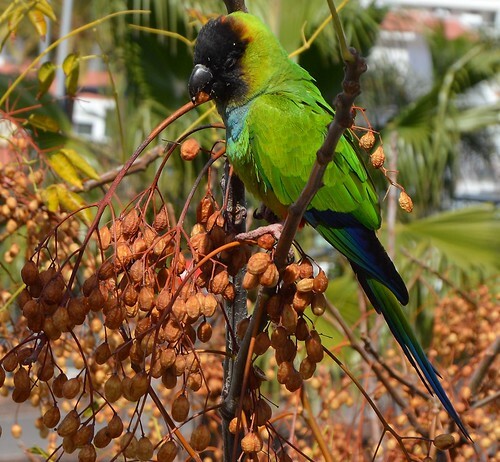 Sadly Santa Cruz considers these foreign intruders (Kramer Cotorras) a menace as they destroy trees and shrubs, and wants some of the 300 in the capital humanely captured and returned to There are many in the south as well, this pic was taken in Playa de Las Americas. I had some time to kill before visiting the Vikings exhibition so adjourned to the port to see what the tide had brought in. No training ships this time but plenty of working ships and a very flash Cafe del Moar cruiser from Barcelona boat club. 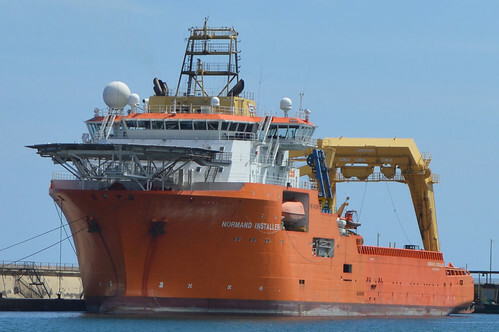 Even the functional ships like the have a certain charm to them. 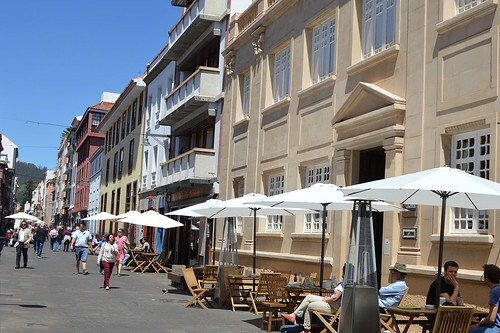 The multi million euro business of refurbishing oil rigs ensures a few not so glamourous additions to the Santa Cruz skyline but the complete facelift to the port and Plaza de España has made the Tenerife capital a bright, modern city. Iron swords so heavy you needed two hands to wield them, boats so sleek and long they looked like serpents with sails billowing in the wind. Come on, who doesn’t like the Vikings, even before Hollywood brought Thor to the big screen, they had to be one of the most appealing conquerers from history. Arriving at the Caja Canarias banks HQ in Plaza del Patriotismo, Santa Cruz, I was just in time for the 5.30 pm start to the Friday evening opening in the Fundacion’s cultural hall, and joined a dozen other people in a guided tour. 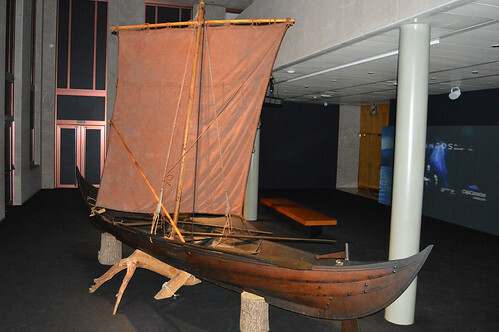 The large ground level entrance was dominated by a model of a Viking long boat, I was soon to learn how the narrow war ships varied from the more sturdy trading vessels they used. 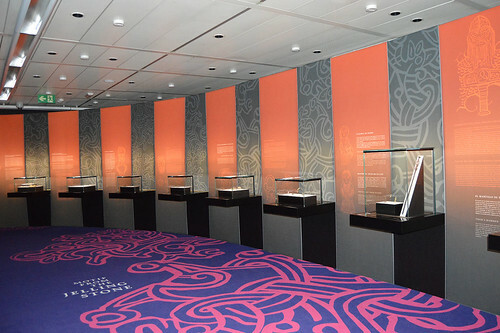 All the exhibits were backed by video screens and static displays in Spanish and English, although the compulsory tour guide gave this journey just in Spanish. 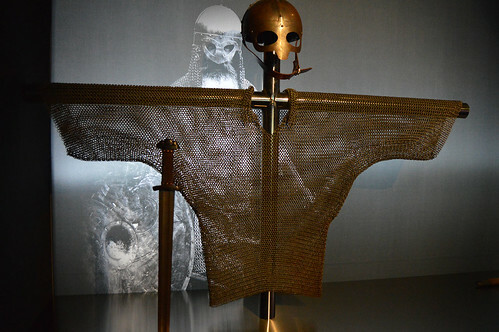 It seems the Vikings were about much more than just pillaging and plundering, their artistic designs and crafts as well as their religious and social structures unfolded as we progressed upstairs into a winding gallery. 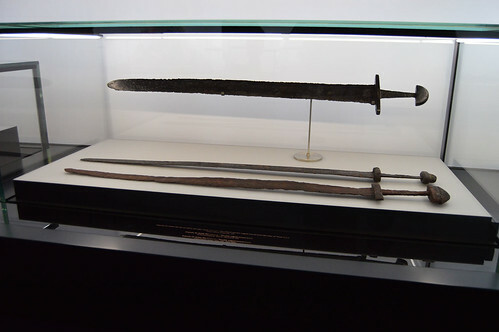 Of course the chain mail, hefty swords and axes evoked memories of the warrior tradition, but a copy of the decorated Jelling Stone paid homage to the meanest of them all King Harald Bluetooth who united Denmark and Norway, and made the new nation christian. 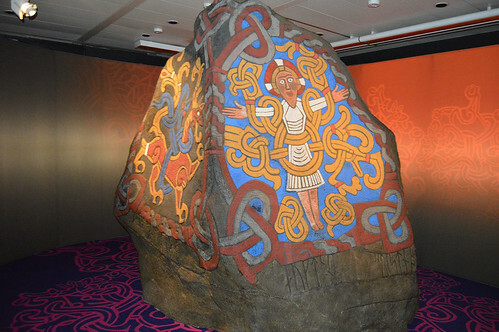 The exhibition has come to Santa Cruz from Denmark’s national museum and includes original artefacts, and well crafted replicas, but the fearsome Viking reputation is genuine. 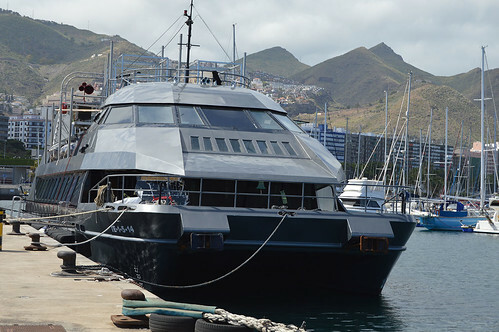 The host building had been converted from its normal open, two floor, stroll around design to a tighter cavern like look, complete with boat design layouts marked on the blue carpet to show the tight confines of the war ships. The subdued lighting added to the atmospheric feel and it was a good insight into a race that has not always been best served by legend status. On the down side, I thought the tour was a little rushed, another tour party was snapping at our heels, especially on the upper level where we were the circular route funelled us back down to the exit. 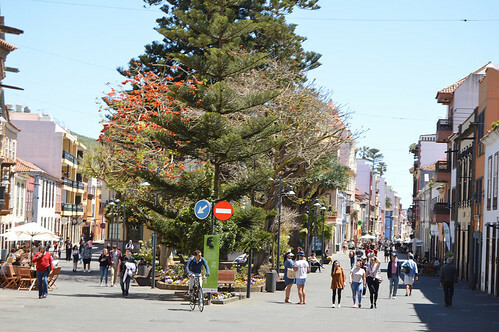 Prices are not advertised on the posters or in many listings, but the basic cost with the compulsory guide is five euros, with no reduction for residents. It is free though for those under 26 or over 65, it was good to see decent numbers on both opening tours on this Friday evening. The exhibition is on to 11th August 2018, Monday to Friday 10 am to 1.30 pm and 5.30 pm to 8 pm, plus Saturdays from 10 am to 1.30 pm, closed Sundays.